Losing a pet is hard, and the grief is like the death of a member of your family. We’re here to help. Companah is a North Carolina company, here to serve you and your family with pet and animal cremation services when you need us. We offer the most advanced and respectful means of taking care of your pet after he or she passes away. Their remains are returned to you in a personalized urn or memorial of your choosing. Companah provides pet cremation urns, memorial jewelry, and keepsakes available for delivery to your home. Companah offers private pet cremation or group cremation services. We offer water cremation – which is a gentle, environmentally-responsible process (it’s also referred to as alkaline hydrolysis). Using water flow, low temperature and minerals, it is more like the natural decomposition that occurs after burial than any other body disposition method – water cremation just accelerates the natural process of soft tissue hydrolysis. After the water cremation process, only the mineral ash of the bones remain – pathogen and disease free. Unlike flame-based cremation, which releases harmful greenhouse gases, the remains contain no black, carbonized ash. If your pet passes away at your home, we can come directly to you to pick up your companion. No matter if it was an expected or unexpected event, we understand how difficult the occasion is – we’re here to make things a bit easier. Just give us a call or send us a message, and we’ll be able to meet you at your home on the same day. 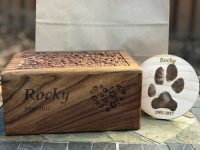 Along with providing pet cremation services, we also offer unique urns and memorial products. This collection includes a wooden urn engraved with your pet’s name and a paw print, also engraved. This urn holds your pet’s remains and will provide a permanent memorial to the life of your companion. As you remember your pet, we can offer a collection that includes an engraved paw print, a biodegradable urn, and a seedling that you can plant either indoors or outside. The seedling is a beautiful Carolina Pine that is locally-sourced and will provide a new an long-lasting memory of your companion. Prices include pickup and delivery within our service area during business hours. After-hours pickup is also available for a small fee. Please call us, email, or send us a text message (use our phone number to text us) at any time. We can arrange a time to pick up your companion at your home or at a veterinary clinic of your choosing. With either option, we pride ourselves on treating your companion with dignity and respect that begins the moment we receive your loved one. We are able to provide traditional cremation as well as water cremation. Both will provide opportunities for you to get back the ashes of your companion if you desire. Companah offers several options to remember your pet. If you choose to have your pet’s remains returned, they will be returned to you in a biodegradable burial urn or a scattering bag unless you prefer to select an urn as a way to memorialize your pet. Please contact us so we can answer any questions you may have. 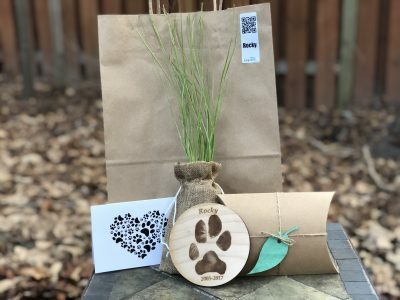 Along with taking care of the cremation of your pet, we offer a collection that includes an engraved paw print, a biodegradable urn, and a seedling that you can plant either indoors or outside. The seedling is a beautiful Carolina Pine that is locally-sourced and will provide a new an long-lasting memory of your companion. Feel free to call us any time. We’re available 24 hours a day to answer questions as you pre-plan aftercare for your pet or to arrange a time to pick up your companion at your home or veterinary clinic of your choosing. Companah offers private and communal options for pet cremation. Click here for a guide that will give you an idea of the cost of our services. We utilize a significant advancement in cremation science which mimics what happens in nature. For each family who chooses to have our practice handle the private cremation of their pet, we donate toward the adoption fee of an older cat or dog. Learn more about Companah – who we are, where we are, and all about our practice. In addition to our cremation services, we offer several options for urns and other items to memorialize your pet – most of them sourced locally here in North Carolina.